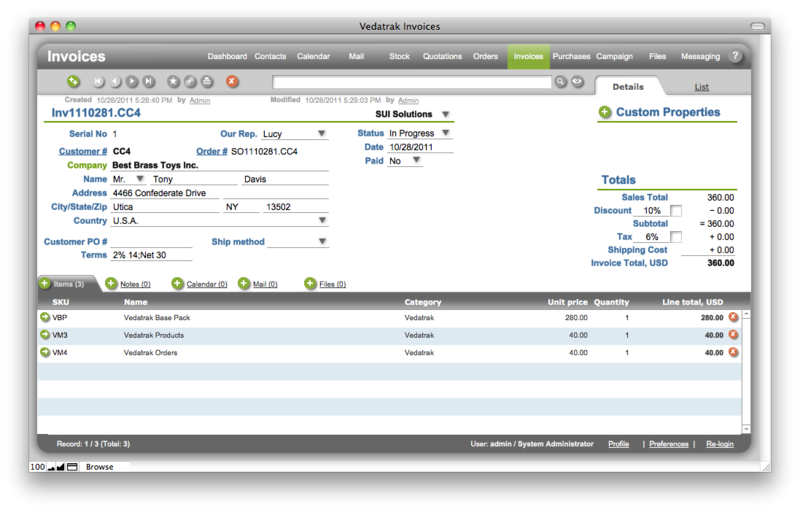 Vedatrak Invoices, a module for Vedatrak FileMaker CRM.Invoices management, printable invoices. The Invoices module supports invoice management and the creation of printable invoices to send to your customers. Invoices can easily be created directly from any order without reentering order information. All invoices are available to each team member. All invoices have a set of standard properties included with the software. Additional custom properties may be added at your discretion. All invoices associated with a contact or order can be easily accessed within the contact's card or the order's card. Each invoice can be associated with a task. A sales rep can assign a task for an assistant to send a newly created fax, for instance. ** If you already purchased Vedatrak Invoices 2.1 and want to upgrade to version 3.1, you will be offered a special upgrade price. System will automatically check Your Downloads and define if you're performing an upgrade. Purchasing a support package in conjunction with Vedatrak Invoices will enable you to rest assured that all technical aspects of using our product will be handled so you are free to provide you or your team with the professional support to effectively use it.